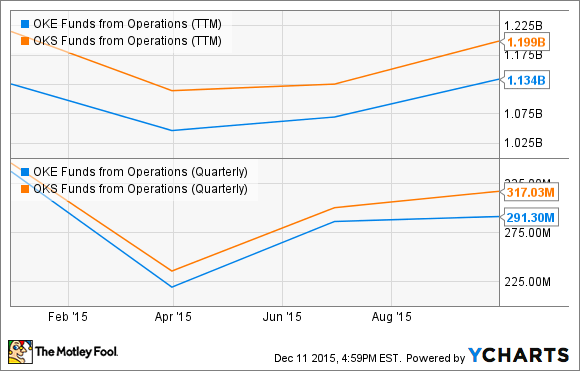 Will ONEOK, Inc. Raise or Lower Its Dividend in 2016? The market is in a panic about all things energy as oil prices fall to decade lows. 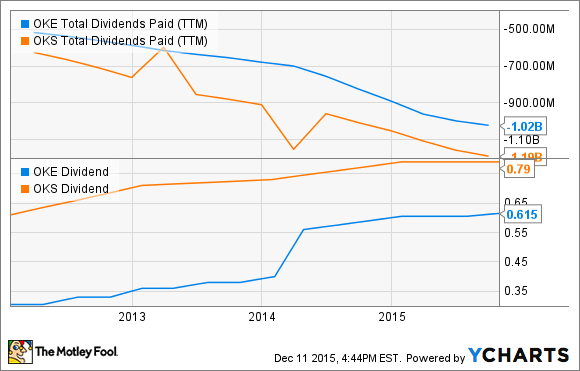 What will this mean for ONEOK's ability to increase its dividend? One Fool chimes in. Pipeline and gathering operator ONEOK, (NYSE:OKE), like many of its oil and gas industry peers, has seen its stock get pummelled over the past year, as oil and natural gas prices stay in a prolonged slump. And while the loss of value is bad in and of itself, ONEOK is often most attractive because of its very large dividend, which is now yielding well over 10%, with the recent downturn in commodity pricing injecting fresh fear into the market. And after fellow infrastructure giant Kinder Morgan's recent announcement that it would slash its dividend by 75%, there are fears throughout the investing community that other companies, like ONEOK, may be forced to take the same drastic action. However, the company just increased payouts about 2% back in October, so there's hope that it will be able to afford another increase next year. So which will it be? Let's take a deeper look at the company. No conversation about ONEOK is complete without referring to master limited partnership ONEOK Partners LP (NYSE:OKS). ONEOK Partners owns the assets, while ONEOK makes a living from its general partner interest (meaning it operates ONEOK Partners), and the dividends it gets from the shares it holds. In all, ONEOK has a 41.2% stake in the MLP. ONEOK Partners is a natural gas and natural gas liquids pipeline, gathering, and storage business. ONEOK Partners is in the gathering, processing, and pipelining business. It takes NGLs such as ethane, propane, and butane out of gas and oil. These byproducts must be removed from oil and natural gas, and they also have separate economic value. NGLs have multiple applications including agricultural and petrochemical manufacturing. ONEOK Partners captures these products at the well side, processes them, and then ships them to storage or to market in its 30,000-plus miles of pipelines. It makes money in two ways: fixed-fee contracts for "toll road" operations, and also gathering/processing contracts where it gets a percentage of market price for those products. The fixed-fee contracts produce steady, predictable cash flows, but price-based gathering contracts are subject to the market. And while there is potential upside if commodity prices go up, it can put a lot of pressure on the bottom line when the bottom falls out, as it has for NGL and gas prices over the past year. A coverage ratio below 1 is OK for even a few quarters, but it's not sustainable, since anything below 1 means it paid out more in dividends than it earned. 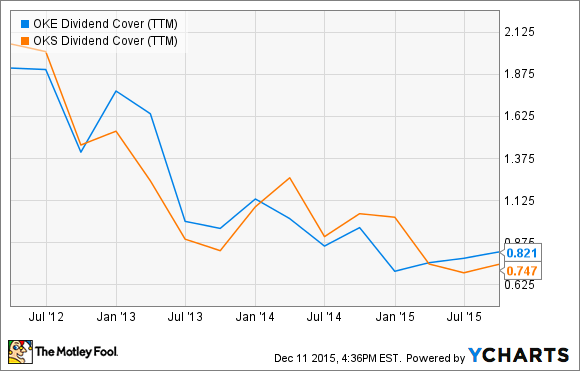 The preceding chart shows that the dividend cover has been gradually eroding over the past couple of years. "For the third quarter, the segment reported a $0.43 average fee rate, which is nearly a 20% increase compared with a year ago. We expect this rate to significantly increase as we complete substantially all of our Williston Basin contract renegotiations in 2015 and receive the full benefit of the increased fee-based margins in 2016." Funds from operations have started recovering as fee-based contracts take effect. ONEOK has a number of levers it can pull to help support ONEOK Partners, and it pulled one of them in August, when it invested $665 million in the MLP. It funded the transaction with $500 million in debt due in 2023, paying 7.5% interest, and the balance in cash, buying 21.5 million common units, plus an additional $15 million to maintain its 2% general partner interest. Furthermore, ONEOK management has maintained that it will keep cash on hand as a margin of safety. Management also reiterated its guidance that ONEOK Partners would get its distribution coverage ratio back to or above 1 in 2016. And while it could use a dividend cut to do this, it looks like a combination of growth and better results from renegotiated agreements could keep that from happening. Further, ONEOK's dividend is a little more secure. ONEOK's earnings last quarter came in at 1.34 times the dividend, and its increased ownership stake in ONEOK Partners will result in a substantial increase in distributions paid to ONEOK, even with the interest expense from the new debt. Lastly, the incentive distribution rights ONEOK holds are relatively conservative, and ONEOK Partners would have to cut its dividend sharply before ONEOK's dividend was at risk. Final verdict: Up or down? It seems very unlikely that ONEOK would lower its dividend, especially with the improvements ONEOK Partners is already showing, and the increased distributions ONEOK is set to receive from its additional investment. As to an increase, I wouldn't count on anything before midyear at the soonest, and probably a modest bump when it does happen. For now, ONEOK is probably going to retain excess cash and let things play out for a while, before committing to any significant changes in its dividend. Income-hungry investors may not like that, but it's a prudent call that long-term shareholders should be happy about.